SEVEN schools are set to play in a fledging league formed to give college teams outside the major leagues the exposure that they deserve. The Universities and Colleges Basketball League (UCBL) is set to open on Saturday at the Olivarez College Gym with the intent of providing an avenue to showcase talent of colleges on a nationwide scale. 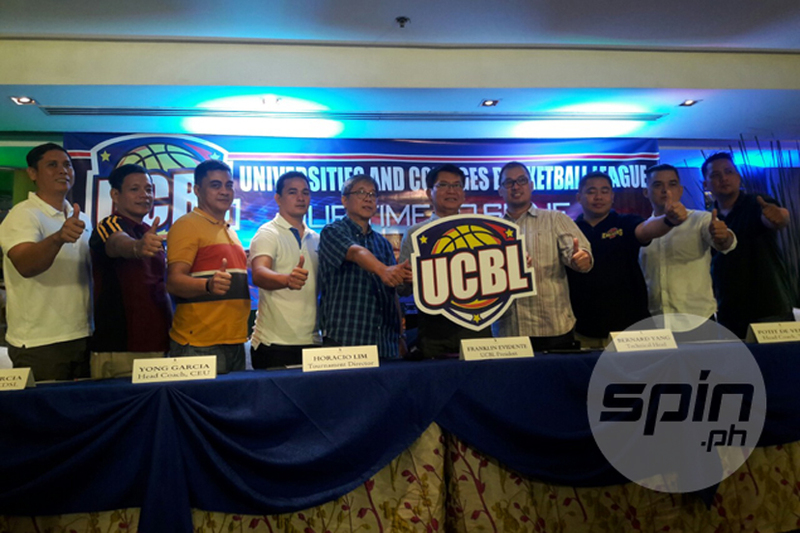 The UCBL is organized by the Universities and Colleges Athletic League, Inc. with its president Franklin Evidente acknowledging the importance of television coverage to a collegiate basketball league to help the players in their future. In a press conference on Monday at The Bay Leaf in Intramuros, Evidente said a collegiate league with television coverage will enhance not just the images of the colleges but also the teams. UCBL games will be aired on IBC-13 on the same night the games will be played on Monday, Thursday, and Saturday afternoons through production outfit Asian Television Content. “With TV exposure, they have an easy transition to the pro leagues. There are more benefits for the schools who are members of popular televised college leagues,” said Evidente. Centro Escolar University and Technological Institute of the Philippines have been tagged as favorites in the inaugural season of the UCBL which will be also joined by Bulacan State University, Colegio De San Lorenzo, Diliman College, Olivarez College, and University of Batangas. The CEU Scorpions will be bannered by Rodrigue Ebondo and Samboy De Leon, top players of the squad that has won numerous titles in the Naascu and in the PBA D-League under new head coach Yong Garcia, who took over the reins from now San Sebastian coach Egay Macaraya. “May pressure, lagi namang nandiyan yan. Ang sa akin lang, trabaho lang at focus sa mga ginagawa namin especially in our practices,” said Garcia. The TIP Engineers are also stacked following their respectable campaign in the Philippine Collegiate Champions League (PCCL) Metro Manila qualifiers. Jorey Napoles and Joshua Alcober lead the Engineers’ campaign in the UCBL. “We have a reputation to build on that the players I hope will take care off. We will do our best,” said TIP coach Potit De Vera. While the teams expressed commitment to this inaugural season, Evidente said the UCBL will do everything to make it a successful endeavor in years to come. “Right now, the commitment of the schools is for the inaugural tournament. We have very lofty ambitions for this league but we have tempered expectations. However, we went into this project knowing that it won’t be easy and we are not looking for it to be a one-hit-wonder in the first year. “Our short term goal is for three years. Hopefully, we have fair success in our first year and the seven teams will come back for the second season and so on,” said Evidente, whose league has Lamoiyan and Euro-Med Laboratories as major sponsors. The tournament director is Horacio Lim while the other officers are Bernard Yang (director), Eduardo Ventenilla (director and treasurer), and Edwin Cacayorin (corporate secretary).